Ryan M. Dietz received his Bachelor of Arts degree in 2008 from Pomona College in Claremont, California. In 2012 he obtained his Juris Doctor from University of San Diego and was admitted to practice in California in 2012. Mr. Dietz is a member of the State Bar of California, the United States District Court, Southern and Central Districts of California, all California State Courts, American Bar Association, San Diego County Bar Association, and the Association of Business Trial Lawyers. He is a volunteer attorney with Casa Cornelia Law Center and is the 2014 recipient of the Pro Bono Publico Award from that organization in recognition of his work with asylum applicants. Mr. Dietz was a Faculty Honor Scholarship recipient at University of San Diego School of Law. During law school, he clerked with the litigation team and construction practice group at a San Diego litigation firm and interned with the United States Army JAG Corps. 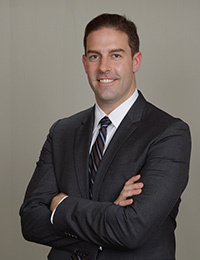 Prior to joining Dietz, Gilmor & Chazen in 2014 as an associate attorney, Mr. Dietz practiced civil litigation at a full-service business law firm in San Diego, handling construction and real estate litigation matters. He currently specializes in workers’ compensation matters.